The products featured below are purchased blank (not engraved). 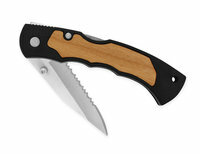 Lockback Knife features stainless steel blade, blade lock, and sturdy pocket clip. Stainless steel blade. Black plastic handle recessed on front side. Size is 7.5" long when open, 4.5" closed. Inserts are uncut alder wood sheets. Lot includes 24 Lockback Knives and 1 alder wood sheet, which makes a total of 24 wood inserts. Materials make 24 Lockback knives with wood insert.